Posted 21.09.2016 at 07:09 in blog by admin / Comments Off on How can Dental Crowns modify your smiles? Dental decay usually involves initiates within the enamel of deep grooves, pits and fissures. Because this is present on the chewing surfaces of teeth. These areas harbor sticky food debris, caries causing microorganisms and their non-self cleansable nature helps in the progression of these bacteria and their harmful by products. Early stage tooth decay can be quite easily managed and arrested with the help of placing simple filling materials after removal of the damaged tooth portions. When this infectious decay involves and penetrates deeper tooth layers, simple fillings are not adequate to restore the structure, function and esthetic value of your teeth. Try Albuquerque New Mexico Dental office for dental crowns. Why Visit Albuquerque New Mexico Dental Office? Large sized artificial fillings which do not exactly match the natural tooth color and shape. It can ruin your smile and become a peculiar source of embarrassment during smiling, talking and laughing in social gatherings and wedding functions. Furthermore, such restorations are prone to break away from natural tooth surfaces when excessive biting forces are applied during eating and chewing food during lunch and dinner. Uniform teeth restorations which can completely cover weakened and decayed teeth become necessary for achieving lost structure and function of your teeth. Albuquerque New Mexico 24 hours emergency specialist cosmetic & restorative dentist Dr William C Gardner at NM Family and Cosmetic Dentistry PC strongly advise fabrication of state of the art fixed dental crown prosthesis on your compromised natural teeth for making these stronger, functional and attractive just like natural human teeth. Call now Albuquerque New Mexico Dental office. A. 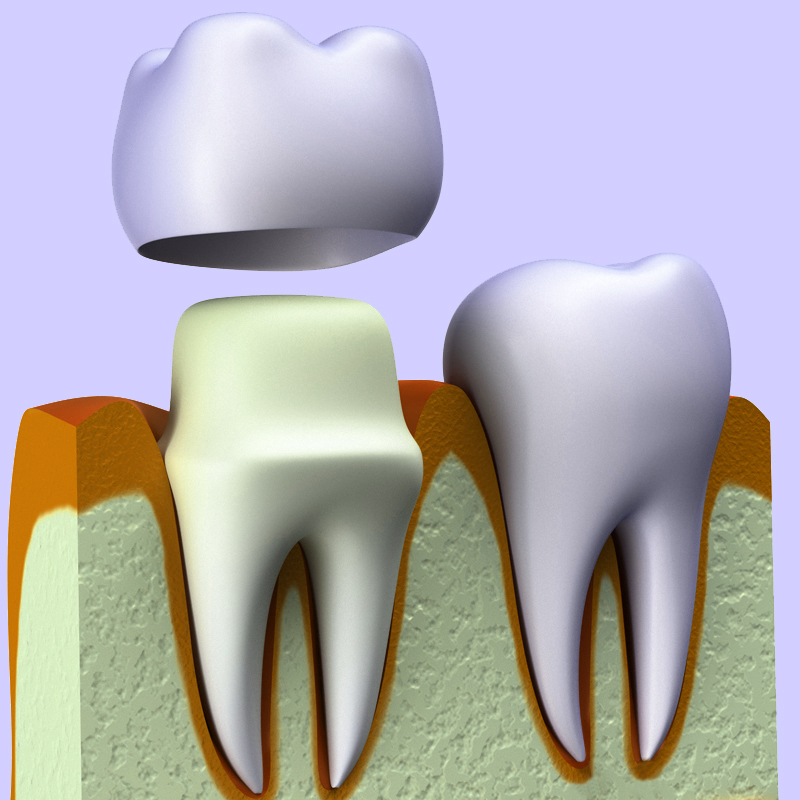 Dental crowns are basically cap-like structures. They help to completely cover and encircle your natural teeth after removal of the decayed portions of teeth. Natural tooth tissues when are not there, help to create space for placing dental crowns. These are important in the dental laboratory and find a position on teeth in the dental clinic. Q. WHICH DENTAL CROWN MATERIAL PROVIDES BEST COSMETIC RESULTS? A. Dental crowns are from a variety of dental materials such as acrylic, gold, dental porcelain and cobalt chromium metal alloys. All porcelain crowns offer excellent cosmetic effects for the enhancement of your smiles. These dental crowns provide the best masking effects on discolored, stained and poor appearance of natural teeth. in conditions where complete coverage cannot be provided with Porcelain alone, metal ceramic type of dental crowns are used which have a sub-surface of metal covered by porcelain material. Call Albuquerque New Mexico Dental office. Q. WHICH CONDITIONS NECESSITATE DENTAL CROWN PLACEMENT ON YOUR TEETH? A. Dental crowns are indicated for fabrication when one of the following conditions affects your natural teeth. Get in touch with Albuquerque New Mexico Dental office for more. Q. HOW LONG WILL YOUR DENTAL CROWNS LAST? A. Dental crowns have shown excellent longevity in recent studies. These restorations usually last for approximately 20-25 years after placing depending upon their location in the mouth. This is also on the condition of underlying natural teeth, clinician’s skill and maintenance care by you. Thus, your dentist can help you in such a situation. Q. WHAT IF THERE IS DENTAL CROWN DISLODGING? A. Dental crowns can dislodge during intake of sticky foods because it is quite natural You do not need to panic at all. Wrap it in tissue paper and bring it to your dentist. You can get it back over your natural tooth in the dental office because it is quite convenient. Q. DO YOU NEED TO FLOSS OR BRUSH YOUR DENTAL CROWNS? A. You need to take care of your artificial teeth just like your healthy natural teeth. Regularly brush and floss your dental crowns twice a day for increasing their life.